I completed 30 days on a ketogenic diet today. I was tempted to keep going, since I was unable to stay in optimal ketosis (above 1mmol/l), even after gaining some insight about how to do it, as I posted earlier. These are my numbers for the entire period. I averaged 37g net carbs for the entire four weeks (first graph) and 25g net carbs in the last two weeks (second graph). As I mentioned before, my body seemed to be resistant to making/utilizing ketones. It is remarkedly efficient at using protein to make glucose. I had thought that if I stayed under 100g net carbs plus protein I would be fine, but after analyzing my data I found that, for me, optimal ketosis is achieved when I keep the protein and carbs under 80g. In the end this was just to much effort. Another deciding factor in stopping the diet was an interesting affect on my heart that I noticed during the 30 days. My family history includes high blood pressure and cardiovascular disease, both of which I have declined to do. However, my heart does have a tendency to have an irregular heartbeat. After about a week I started having persistent irregular (and annoying) heart beats. At first I attributed this to increased consumption of fish. High levels of mercury can lead to irregularities in heart beat, and fish are known to be contaminated with mercury. I have had a problem with my heart once before when I suddenly started eating more fish. However, in this instance, I stopped the fish, started eating more cilantro (which chelates mercury) and did not notice any improvement. As it turns out irregularities in heart rhythm are associated with ketogenic diets. Many people find electrolyte supplementation to be useful. Electrolytes did not help me. The hormone that stimulates the body to make more glucose from protein and the by-products of fat metabolism is adrenaline. It would make sense that adrenaline is elevated during times where carbohydrate intake is limited. And adrenaline would indeed make the heart more reactive. I had thought that eventually the body would become used to using ketones as fuel (keto-adaptation) and then adrenaline would be reduced. I did not reach the point where that occurred. Other symptoms I experienced that indicated my adrenaline was pumped up, were an increase in heart rate and orthostatic hypotension. Orthostatic hypotension is a sudden drop in blood pressure when going from lying down to standing. It is experienced as a head rush or dizziness. I was having this occur frequently during the ketogenic diet, however I do not remember when exactly it started and suspect it predated the diet. The increase in heart rate occurred more dramatically. About a month before I started the ketogenic diet I purchased a heart monitor. My typical afternoon resting heart rate was about 61-63 bpm. Last week, it clocked in at 73 bpm. Today it was 67 bpm. I decided to test the resting rate, since about two days after reaching the optimal ketosis (around the two week mark) my heart rate jumped up about 10 bpm during my usual rowing session. I thought perhaps I was exerting more effort or the meter was wrong, but after the jump it remained high during subsequent sessions and I validated the heart rate with a second meter. I thought getting into ketosis would be a snap. You burn fat; you make ketones; your body eats the ketones. Simple. Or so I thought when I started the ketogenic diet. I explained earlier how I started a ketogenic diet on a whim and then after nine days decided it wasn’t for me. As I started to transition off the diet, I was left wondering if I’d even made it to ketosis. To answer that question, I decided to order a ketone meter, go back on the diet for a day or two and see if I was ketotic. Saturday morning I took my first fasting measurement. It was 0.2 mmol/L. This would be a typical level for a non-ketotic state. Since Friday I ate 132g of net carbs this was expected. However, since I had been eating low carbs for a week, I figured if I dropped down to 20 grams carbs I would test ketotic (>0.5) in the morning. Wrong again. Saturday was a strenuous day on the farm and despite eating only 19g carbs I was only 0.3 Sunday morning. I was shocked! I was so surprised I tested it twice. “So much for that doctorate in physiology,” I thought. After some thought, I decided my body was really good making sugar out of what was available and was resistant to producing ketones. This is when I started paying more attention to the protein I was eating. Proteins as well as carbohydrates can be easily converted into sugar. Indeed even glycerol, the backbone of fats, is used to make sugar. On Tuesday (morning of day 4) I hit a ketone level of 0.5, the minimum required to claim a successful ketotic diet. I ran out of blood test strips that day (This was only supposed to take a couple days, so I only ordered 10. ), but was able to continue monitoring using urinary strips. I estimate I fluctuated around 0.5 the next couple days and when I was able to test my blood again on Friday it was only 0.4. So not a solid ketosis yet. I went online looking for more information and learned that not only was it not simple to induce ketogenesis, it also took at least three weeks to become keto-adapted. Geez, I though just getting into ketosis would be enough, but apparently the body doesn’t use the ketones efficiently until later. It took me a week from when I restarted the diet to reach a solid ketosis. During that time, I continued to focus on lowering my protein to about 60 grams/day and keeping my net carbs around 24 grams. My ketone levels on day eight were 0.6, day nine: 1.1, and day ten: 0.9. Keto-adaptation is my next target. Luckily, there is a way to measure keto-adaptation. Once the body becomes efficient at using ketones as fuel, the urinary excretion will decrease and may completely disappear. It is recommended that one give a ketogenic diet at least one month, since this is the typical length it takes to adapt. The idea of ketotic diets has been mentioned in my social circles for some time. I didn’t pay much attention, figuring it was just one of those fad diets people get into. Indeed, it seemed like it was just a revival of the Atkins diet and since the focus was on weight loss I wasn’t really interested. I already knew how to feed my body in a way that nurtured it and kept it at a healthy weight. Besides, the ketosis I was familiar with was the ketosis that occurs during starvation and that didn’t sound like a fun diet. 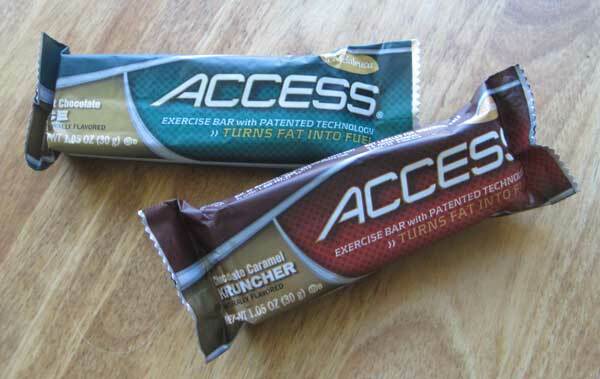 Last spring, my interest in athletic training and the research on the Access® Bar, an exercise bar formulated to switch off adenosine so that the body can easily burn fat reserves, got me interested in how fat burning works. Dr. Larry Wang, the researcher that formulated the Access Bar, found that humans, unlike animals that hibernate, will die of hypothermia long before they have exhausted their body’s fat reserves. This was amazing to me, because I thought the whole idea of fat was to have extra fuel available when we need it. What I learned was that the body hoarded fat like gold and that even in the face of death would not simply release it. If it doesn’t allow you to burn fat in the face of death from hypothermia, do you think it will allow you to burn fat when you go to the gym? Thinking to help people living in the extreme cold of Canada, Dr Wang, a professor at the University of Alberta, was interested in unlocking fat burning. In order to figure out how to do this, he subjected lightly clad students to below freezing weather for three hours with and without his formulation. His research demonstrated that the formulation (now called the Access Bar) could indeed unlock fat burning in the students and allow them to maintain body temperature longer than when they did not use the bar. You can read a summary of his research. Eventually, Tammy van Wisse, a performance swimmer, learned about the bar. She writes about swimming the English Channel with her brother and how he almost died of hypothermia. The next year they completed the swim using the Access Bar without any issues. Not only did they both stay warm, but she lost 22 pounds during the 8 hours and 23 minutes it took her to cross the channel This surprising amount of weight loss, was much more than the year before, suggesting a better ability to mobilize fat. Still, ketogenesis didn’t really catch my attention until my partner decided to go on a ketotic diet. People report more energy, less food cravings, and easy weight loss on a diet that induces nutritional ketosis. I was interested in more energy and was looking for a metabolic plan that might help me reduce my overall food consumption. I was also curious about how my body would respond to nutritional ketosis. When my partner started his diet, I joined him. Since we went from our regular diet one day to ketogenic diet the next, there was no time for elaborate preparation. My partner had done a strict Atkins protocol years before, so he knew what his plan was. I did a quick search of the internet to see what I needed to do. The basic gist of the diet was low carbohydrate, moderate protein and high fat. How low is low carb? Well, 20 grams a day is certain to induce ketosis. However, it seems that anything under 50 grams might also work, depending on the person. I used the Keto-Calculator to figure out what my targets were. I thought my diet worked well for my body. Since it was based on free selection of food over a long period of time, I was impressed by how constant my day-to-day selection of food was. I certainly was entrained to these proportions of macromolecules. Was this optimal health, or simply a habit? I thought I had the “right” way of eating for me, but wondered what else was possible. I embarked on the ketogenic diet. I did not like it, nor did I like how I felt. I stuck with it only because I was curious. I thought it would be enjoyable to indulge in extra fat, but I got no pleasure from it. I missed eating lots of fruit and my beloved tortilla chips. 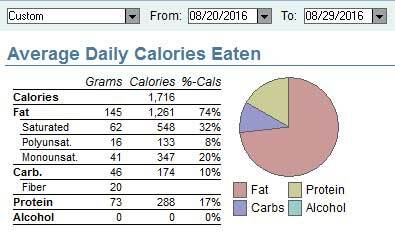 Here are my averages for the end of the first week: 137 grams fat, 32 grams net carbohydrates, 100 grams protein. I had initially committed to a week trial and on the 9th day I ended the ketogenic diet by slowing adding more carbohydrates. However, I kept wondering if I had even reached ketogenesis. I also noticed that my protein, which I had not been watching closely, had crept up 20-30 grams over target. Excess protein is converted to sugar in the body and I wondered if that blocked me from becoming ketogenic. The question about if I had given the diet a fair trial loomed large. What if I never even entered ketosis? How hard can it be to become ketotic? I felt certain I had, but I needed proof. * Carbohydrates are “net carbs”. This means total grams carbohydrates minus the fiber.